Magento eCommerce platform - Sports and Outdoors Magento Template. Climbing Magento Template. 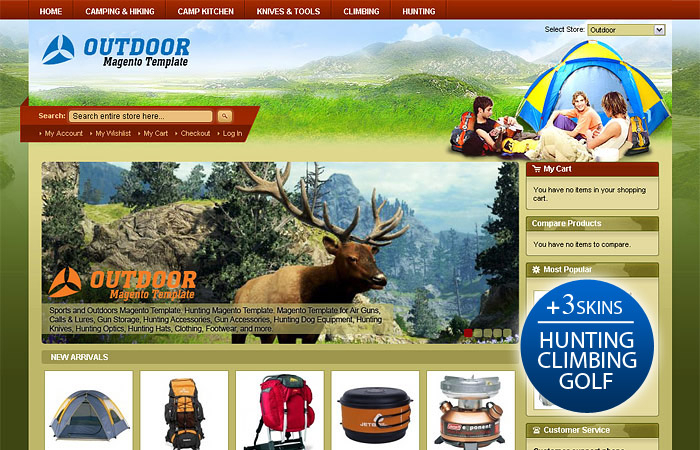 Hiking Magento Template. The Sports and Outdoors Magento Template is an ideal combination of sharp, colorful, and earthy elements, making it the perfect theme for a shop selling backpacks and bags, tents, apparel, camping and hiking equipment, outdoor recreation, climbing gear, hunting gear, and more. The design of the main template corresponds to the subject Outdoor and reflects a holiday atmosphere in nature's lap. Primary colors of a template are natural – green and sand with accents of dark red. Climbing skin is a special Magento template for the sale of climbing equipment: block rollers, carbines, clips, descenders, guide ropes, harnesses, crash pads, etc. Golf skin is a Magento template for the sale of golf equipment: from irons and golf balls to golf-carts, GPS units, and more. Hunting skin is made especially for the sale of hunting kit. It is a suitable template for the sale of gun accessories, bandoliers, backpacks, hunting knives, calls and lures, axes, flasks, compasses, and more. Pay attention to specially structured blocks in the right template column: ”Sign Up for Our Newsletter,” icons of the social networks Facebook and Twitter, “Testimonials Block,” ”Customer Service” with a customer support phone, and ”Most Popular.” There is also a block for ”My Cart” in the right template column. Additional modules/features: newsletter sign-up, most popular, home page banner, home page products, customer service block, social networks, testimonials, payments, SEO block. It is optimized for fast loading, search engines, and usability. The homepage is fully HTML editable. Displays products on the store home page, customizable through the back end. You can have the theme up and running in your store very quickly!